Acronym for Men In Black ( artist conception left ). 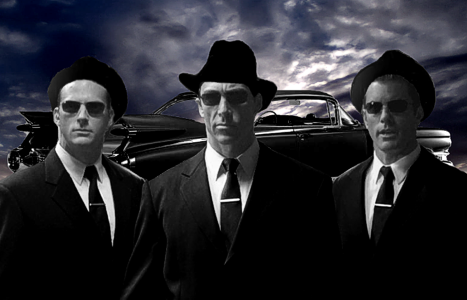 The MIB were originally the subject of UFO lore and were made popular as characters the 1997 fictional sci-fi motion picture MIB Men In Black. They are so named because their attire typically consists of perfectly tailored jet black suits with matching hats, shoes, ties and shirts. They are typically encountered in groups of three and travel in black sedans, often vintage Cadillacs with their signature tail fins and lights. Apart from their appearance, hollywood portrayals of the MIB bear little resemblance to the encounters and phenomenon documented in ufology. Some MIB have been reported to have darker, somewhat oriental features. Others are pale and zombie like. They tend to speak with odd accents and clichés reminiscent of classic radio dramas and gangster films. Their modus operandi is to confront UFO witnesses, intimidate them into silence, obtain physical evidence, and then suddenly depart, sometimes vanishing completely once they are a short distance away. Governments have denied that the MIB are official agents of any kind. Some ufologists hypothesize that the MIB are a special class of aliens or androids whose job it is to preserve the secrets of alien visitation. Another theory is that they are part of a secret terrestrial organization operating in concert with aliens for the same purpose. At about 10:45 PM on Friday July 29th, 1977 J. Randall Murphy was driving his 1964 Pontiac station wagon along a remote stretch of Highway 95 between Golden and Radium in British Columbia Canada. He was heading south into the Columbia Valley to visit his mother in Invermere. The Columbia Valley is part of the Rocky Mountain Trench, a great valley extending 1400 kilometers from Montana through BC to the Liard Plain just south of the Yukon Territory. It is a well known point of reference for aviators and easily seen from space. It also has a history of strange phenomenon including UFO and Bigfoot sightings. Randall was in the vicinity of the small town of Harrogate, when suddenly a black pristine 1959 Cadillac traversed the highway from east to west directly in front of him. Randall recalls: "It was very dark and there was no other traffic on the highway. Because the Cadillac traversed the road perpendicular to my car, my headlights, which were set on high beam, shone directly into the side windows of the Cadillac, illuminating the interior & passengers. I saw three MIB in total. Two in the front and one in the rear passenger seat. Even though it was a pitch black night, all three of them were dressed in black overcoats and were wearing black hats and sunglasses." The driver was concentrating intently on the wheel, a dull purple glow from the dashboard illuminating his face. The front passenger was looking out his side window and he looked directly at me as the Cadillac sped by. His face was pasty white, somewhat drawn, intense and expressionless. I felt as though we had made eye contact. A third MIB was seated in the rear passenger side. He was turning his head toward me in a sort of robotic manner and he barely had time to spot me as the Cadillac rocketed past. None of them were in a state of panic or out of control, as if this was the sort of thing they were used to. The last I saw of the Cadillac was its red tail lights fading into the depths of the valley below, leaving a white mist of some kind in it's wake. The sighting only lasted about three seconds, but as is commonplace in automobile accidents, the event seemed to happen in vivid slow motion detail. I jammed on my brakes to avoid what would have otherwise been a certain collision and the Cadillac missed me by mere inches. Back in '77 I had no idea what the MIB were and I didn't become familiar with them until years later when I picked up a Time-Life book with an article about them. So it doesn't make sense that the observation was due to some psychological projection like road hypnosis. Anyway, I pulled the Pontiac onto the shoulder and got out to inspect the scene. The mist the Cadillac had left in its wake was dissipating and there wasn't a sound to be heard except the Pontiac idling quietly on the side of the highway. There was no sign of the Cadillac and to my surprise there was no road intersecting the highway either! On the east side of the highway was a dense forest that rose up the mountain side and on the west side was a steep grade that continued down into the valley, and I could see the trail of mist that the Cadillac had left behind descending low over the bush and between the trees into the darkness. Fearing some kind of freak accident I backed up the Pontiac and aimed it's headlights down the grade as far as I could. I also turned off the engine to listen for any faint sounds. However there were no sounds or sights other than the trail of mist which soon evaporated into the air leaving no trace of what had just occurred. I continued to check for evidence to explain the event, but there was nothing to be found. There were no tire tracks on either side of the road, no broken or flattened vegetation ... no skid marks ... no lights ... no flames ... nothing. After starting the Pontiac, I climbed a few dozen yards down the grade and searched in vain for another ten minutes. Then I decided to abandon the scene. I didn't encounter any other traffic until I reached Radium. I stopped at the RCMP office to report the incident, but they weren't in. On the way back to work in Glacier Park, I stopped and examined the spot again during daylight, but there was nothing out of the ordinary to be found. I also monitored the local media for news of missing people, accidents or lost Cadillacs, but nothing was ever reported. Below is an is an illustration of the Cadillac I saw. It's configuration matches that of a 1959 special edition Eldorado Brougham. Total production was a mere 99 vehicles that were factory priced at $13,075. On another occasion I had an odd visit by three men dressed in classic MIB attire who claimed they were Jehovah's Witnesses. The visit came in the summer of 1990 shortly after I started USI. Unlike typical Jehovah's Witnesses, these three were only interested in ufology related biblical information. They could easily cite biblical passages that suggested technology far in advance of biblical times. While two of them took turns reciting this information, their leader sat and stared intently at me, making me feel nervous and physically very shaky, like nothing I've felt before, and upon departing they did not leave any of the usual Jehovah's Witnesses publications. A few days later, some genuine Jehovah's Witnesses came to visit me. They had never heard of the other three who had paid me a visit and were surprised that any others had been covering their area. Although I am not a member of any religion, I typically do not turn these people away. Although I do not share their religious views, I do believe that they are in their own way, seeking a higher truth, and I have spoken with them numerous times before and since. Usually they arrive in pairs rather than threes, and they are nothing like the three MIB that came by my home in 1990. According to a Time-Life article on the MIB, at 8pm on September 11, 1976 Dr. Herbert Hopkins, a consulting hypnotist from Maine received a telephone call from a man claiming to have been with the New Jersey UFO Research Organization. He wanted to discuss a case that Hopkins was involved with. Although this was in the days before cell phones, Hopkins had barely hung up his phone when the man appeared at his door. The visitor was an MIB, dressed entirely in a perfect black suit, a dark blue shirt gray gloves and a black derby hat. The MIB took his hat off and Hopkins noticed he was completely bald with a fine plastic like complexion. At one point the MIB wiped the back of his glove over his lips accidentally causing a smear of what looked like ruby lipstick. When this happened Hopkins noticed that MIB did not seem to have actual lips. He had a sort of out of balance oriental quality and eyes that weren't perfectly round. During the course of the interview which lasted about twenty minutes, the visitor ordered Hopkins to destroy all the material he had relating to UFOs and that if he did not comply, he would suffer the same fate as Barney Hill. Then the MIB asked Hopkins to remove one of the coins in his left pocket and hold it out in his hand. So Hopkins held out a penny and the MIB dematerialized it in full view. Then the MIB said that his energy was running low. As Hopkins watched, the MIB slowly made his way outside, down the stairs and disappeared around the corner into a bright blue light. Hopkins rushed to see if he could spot a car or anything that might have been responsible for the light, but there was nothing there. Hopkins was so unnerved by the experience that he destroyed his research materials and suffered nightmares for weeks. He also heard sounds on his phone line that the phone company confirmed were unauthorized taps. It also turned out that the New Jersey UFO Research Organization did not exist. Although the MIB phenomenon is often thought of as something concurrent with the Modern Era of ufology , looking back through history and mythology, one can find their ancient counterparts. A common example is the account of the three wise men or magi who visited Jesus, the deity of the Christian religion. According to the story, these well dressed men had magical powers and followed a bright star like object that had led them to the place of Jesus' place of birth.